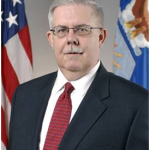 Donald Thieme, courtesy of Naval War College. In a crisis where military forces are deployed, information operations and public diplomacy specialists must be integrated into planning and operations from the first day. This was the conclusion of a case study of mass atrocity prevention and response – OPERATION PALLISER, the British intervention in the Sierra Leone civil war in 2000 – by retired Marine Corps Lieutenant Colonel Donald Thieme. The operation was led by Brigadier David Richards. The British “side-by-side” intervention combined peacekeeping with diplomacy. Thieme’s comments on multiple audiences – indigenous victims, perpetrators, bystanders, regional actors, members of the force, and the international community – suggest that Public Diplomacy must be locally and regionally aware, active, and nimble. Quoting Gordon Rudd that “Ad hoc is a hard way to do business,” Thieme pointed to the value of what he called “communication packages” – regionally deployable teams that have planned for participation in sudden crises. 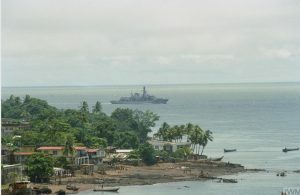 HMS Argyll off the coast of Sierra Leone, 2000. Crown copyright IWM (UKLC-2000-084-018-011). Some members of the Foreign Service may know Thieme from his tours as an attache at American embassies in Warsaw and London. In 1989, serving with a Marine unit, he helped evacuate the American Embassy in Beirut. Now retired, he teaches at the Naval War College. IO activities were conducted by a very small subset of operators in Richards’s headquarters, but to brilliant effect. Realizing that the information domain is a marketplace of available information and competing “brands” and narratives, his staff achieved comprehensive local awareness and penetrated and exploited indigenous, national, and regional media. This process was all driven by a smart “IO Major” who was not designated as such, but inherently understood and created the requisite effects, designing cartoons for the newspaper, getting onto all of the radio stations, and ensuring that Richards “conducted radio interviews and shows throughout the country to ensure that everyone could hear [his] voice directly.” It is hard to overestimate the impact and effectiveness of this ability to simultaneously compete for “narrative supremacy” across multiple lines of IO—domestic (perpetrators, victims, and bystanders) as well as other contributing military and police forces in the UN structure, regional actors (e.g., Liberia, Nigeria), and the rest of the intervening and international community. 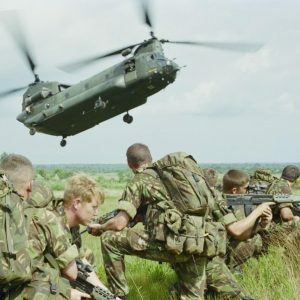 British soldiers wait in open countryside as a RAF Chinook rears up to land in Sierra Leone. Crown copyright IWM (UKLC-2000-084-024-026). To be viable, an MAIF (mass atrocity prevention force) must have four core capability sets: information and communications, command and control, force projection, and intelligence. Properly considered, integrated, and planned for, these capability sets allow decision makers to quickly move past the “what tactical force and operational how” questions to deal with far more important and trickier “when and strategic/campaign how” questions that will frame the mission, inform the detailed planning and decision-making processes, and provide the best opportunity for an effective genocide/mass atrocities response/prevention operation. Building on the ideas of Admiral James G. Stavridis, General Richards, and Admiral Michael G. Mullen, all of whom repeatedly emphasized the primacy of information-communication interaction from the strategic to the operational level, the MAIF must have a high-capacity deployable communications, command, and control (C3) package that includes IO capability (technical) as well as the human ability to study, see, seize, and exploit information domain opportunities in the “Battle of the Narrative” that must be waged. This battle is fought for at least six audiences: indigenous victims, perpetrators, bystanders, regional actors, members of the force, and the international community. The British fought this battle in Sierra Leone, as did the United States in northern Iraq during Operation Provide Comfort. 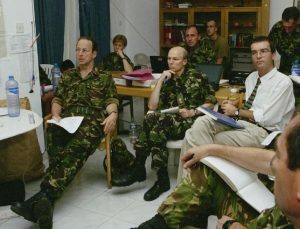 British soldiers and diplomats together at the British High Commission in Freetown during Operation PALLISER. Nearest the wall map on the left is Brigadier David Richards, Commander of the British Forces in Sierra Leone. Crown copyright IWM (UKLC-2000-049-001-002). 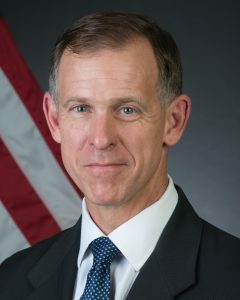 Deployed forces must carefully plan for inclusion of vibrant and well-integrated communication packages that do not just provide information but enable effective command and control. In addition to the purely military portion, force projection requires the forward deployment of diplomatic teams, security and defense sector reform specialists, public diplomacy assets, and financial teams. The diplomatic teams must be on the ground in the first lift to ensure planning for the transition from the first day, but also to convey the powerful message that this is not just another invasion-like operation by outside forces. Rather, it is a “whole of government” response to an emerging crisis designed to engage and reply across the full spectrum of actions needed to effectively restore security and protect basic human rights while also ensuring an inclusive dialogue between diplomats and soldiers throughout the operation. * * * Public diplomacy teams, fully resourced and with an “open tent,” must be deployed with the force to ensure accurate and timely reporting, and engage a daily battle to assert the good news narrative locally, regionally, and globally.